Animal onesies have become a popular feature on slopes across Europe and America. They are super comfortable, warm, bright and baggy enough to ski and snow board in so we can see why. Plus, it’s pretty amusing to see a tiger or two on the pistes, an adventurous dinosaur exploring the powder or a unicorn wiping out as everyone knows unicorns cant ski. Last year we saw a group of giraffes on a ski lift and it certainly made everyone smile. We weren’t sure whether they were fully prepared for a night of apres ski or whether they just wanted to stand out and get some great pictures worthy of social media. It certainly looked like they were having a lot of fun zipping past over skiers in what appeared to be a fast paced downhill race. We often get asked what’s best to wear on a ski trip and it really depends on ability. I would never suggest that a beginner, who is likely to have the odd fall here and there, wears an animal onesie as they aren’t waterproof so it won’t keep you dry. Plus, its fairly daunting learning to ski so you will probably want to just concentrate on skiing rather than having any added distractions. A dinosaur tail getting in the way of your Snow Plough turns could be a bit disastrous leaving you whizzing off on one ski completely out of control. In contrast, if you are a confident skier and part of a large group of friends or part of a University trip then statement animal onesies are the perfect choice. You can wear them over your ski gear and there is a lot of fun to be had racing down the slopes dressed as an animal. Ski resorts have launched hashtags on social media encouraging skiers to tag themselves in their alternative ski wear. This guy found fame in a Panda Onesie with #WhistlerOnesie on Instagram gaining likes from the skiing community because 'Pandas like to ski'. Now grab a onesie and face the cold in style. Oh and did we mention that if you are flying with Easy Jet and trying to keep luggage to a minimum then onesies also double up as a warm pair of PJs, evening attire, apres ski costumes, rave ware and just about everything else. Have fun and stay safe. Are you making a Christmas Eve box? When I first heard of a Christmas Eve box, I have to admit that I thought it was crazy because who opens presents on Christmas Eve? Everyone knows that you have to wait until Christmas Day after Santa has visited. Well I’ve converted and Im making a Penguin themed Christmas box. This year, we are making a Christmas box with a few small gifts, treats and other goodies that we can open and enjoy on Christmas Eve. 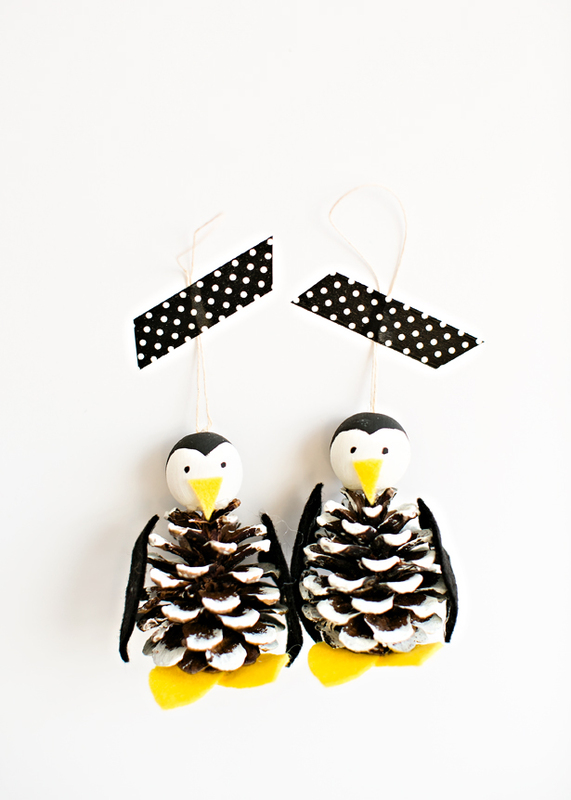 In fact here’s what’s going in our Penguin themed Christmas Box (so far). Pyjamas for each family member have to be included in a Christmas box. We often spend much of Christmas morning in our PJ’s after getting up early to open the first round of presents, interspersed by a full English breakfast followed by a few further presents. Having a brand new pair of sleepwear is great and this year we are all getting animal onesies. I am going for a Christmas theme with Penguin Onesies and I can’t forget to get something fun for the dogs too. Traditionally Christmas Eve evening is spent in front of the TV watching a movie. This year I am throwing in a Penguins of Madagascar DVD into the Christmas box. I've never seen it but I am a huge fan of Madagascar and hoping that it’s a feel good movie. Are there any other good penguin movies? Christmas markets are always full of delicious smells and for me one of those has to be Hot Chocolate and other probably Mulled Wine. Whilst the two don’t necessarily go together, I think that there is plenty of time to enjoy both throughout Christmas Eve. I've found some great Penguin mugs at Debenhams where its now a 4 mugs for £10. As a kid, I always left Mince Pie outside for Santa and to ensure the mince pies were edible we always use to sample one or two on Christmas Eve. For me this is a tradition and one I’m definitely keen to keep because you can’t beat a homemade mince pie. We will be adding some delicious homemade mince pies in the box which we intent to make on Christmas Eve. Reading is important and over the Christmas period when there are so many distractions I think its important to find time to relax and read. It’s a great way of calming down after all the madness of Christmas. I will be adding copies of The Snowman and The Snowman and Snow dog by Raymond Briggs into the box as its such a great Christmas story. And there are a few penguins in there. What are you putting into your box? Halloween is a great excuse to dress up and scare the living daylights out of all your friends, family and neighbors in Zombie fancy dress, as a witch, a skeleton or even Dracula himself. But what if you have young kids who are literally terrified at the thought of seeing Trick or Treater's at the door on Halloween or what if they are too scared to dress up as a scary Zombie? In the US, Halloween is one of the biggest holidays in the year and whilst dressing up is a key part of the celebrations, Americans choose a wide range of costumes including superheroes, pirates and animals. We’ve come across a couple of blogs this year suggesting alternate costumes for Halloween and here are the most popular alternatives. The boy wizard Harry, is a popular choice for all young children who are fans of JK Rowling’s books and the many films that have been released in recent years. A Wizards cloak and a stripey red and yellow tie or scarf are all that you need to look like you are ready for your first year at Hogwarts. 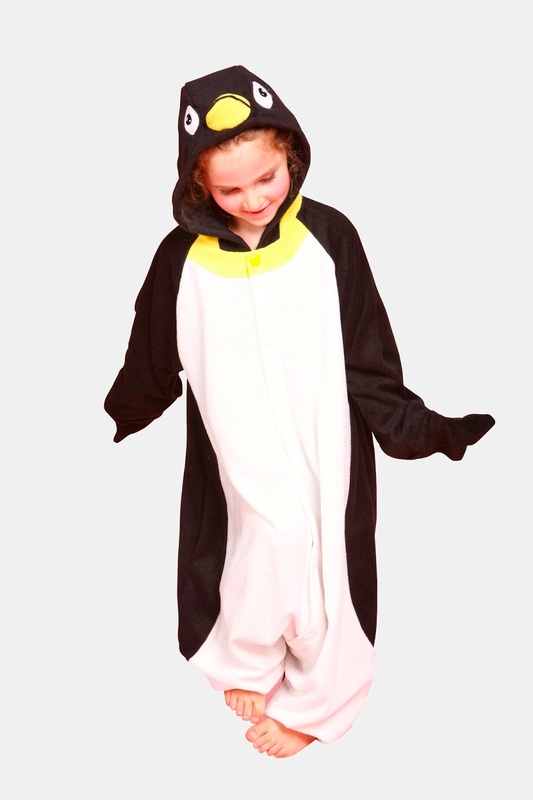 Animal onesies are very popular in the US as they are both comfy and practical at this time of the year as the temperature drops and Winter draws in. 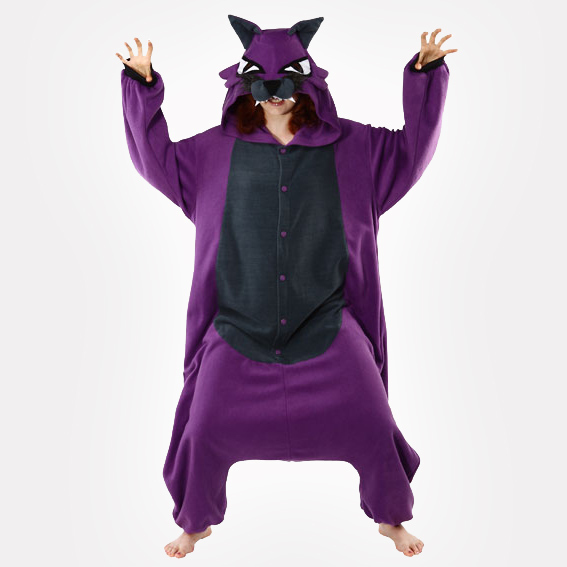 Our favorites for Halloween are the BCozy monster onesies and these are available for adults and kids so the whole family can coordinate. After the recent success of the Tonight Show with Jimmy Fallon and Meghan Trainor we think there might be an influx of green monsters and giraffe lurking around this Halloween. Super heros are always a popular option with both young boys and girls who want to dress up as their idol from their favourite TV show or comic. Batman and the Dark Knight results in some great Halloween costumes as do a fun Batman, Robin, The Joker and Batgirl combo. Or you can never go really wrong with Superman and Supergirl. Sloths are care-free, slow moving animals that spend most of their lives hanging from branches of trees asleep. They are super cute animals and there is a lot of support for these little guys including a website called Slothville which has set up a Sloth Appreciation Society. Yes, its full of cute sloth pictures and has heaps of supporters all celebrating how wonderful they are. Do you have a sloth like friend who has a care free attitude and relaxed lifestyle which is the envy of all around? The one who shows up late but doesn’t care and somehow you can’t get mad because they are just ‘sloth like’. We’ve rounded up 5 sloth products that you need in your life to make the world a more relaxing place. Sloths are known for taking life easy and taking time out to relax. 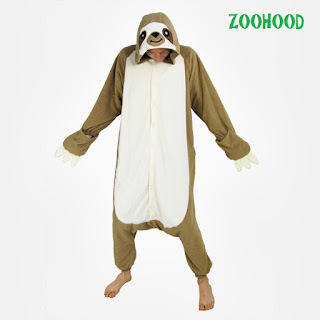 The sloth onesie is ideal for lazy pyjama days and sleepy Sundays. Enjoy a day of chilling and find time to rejuvenate and de stress. The super soft, cuddly, brown and cream sloth onesie features a cute sloth face and claw hand covers which can be worn over the hands or can hang loose if you want a slightly milder sloth look. These bright coloured, sock it to me, fun socks are all the trend and a flash of these will certainly put a smile on your colleagues faces. 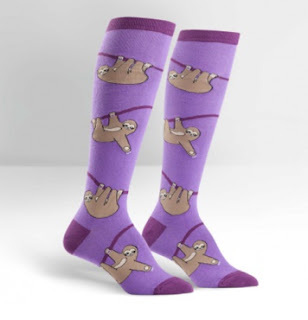 Knee high, pink socks feature little sloths hanging from tree branches waving and smiling. We love these socks almost as much as their name; sock it to me! 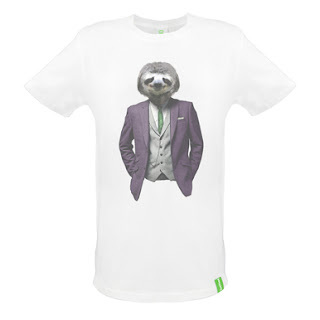 The well-dressed sloth t-shirt features a rather smart looking Sloth in a purple jacket and grey waistcoat. It’s quite a contrast to a Sloths usual attire making it ideal for any laid back friends and family members. Part of the Well Dressed Animals range, this t-shirt is made from organic cotton and printed in the UK. 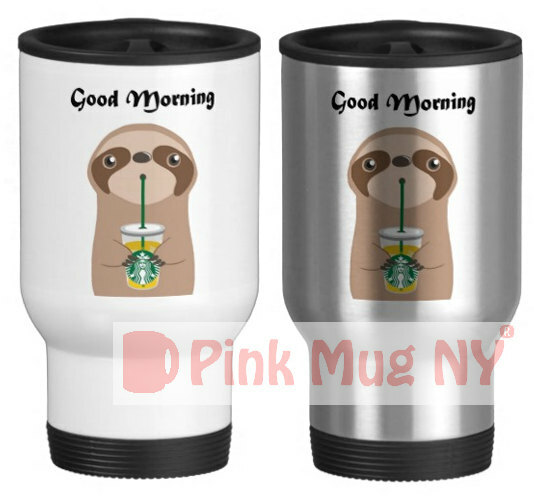 The ‘I Love Starbucks’ personalised Sloth coffee cup can be personalised to make the perfect gift for any sloth loving friend. 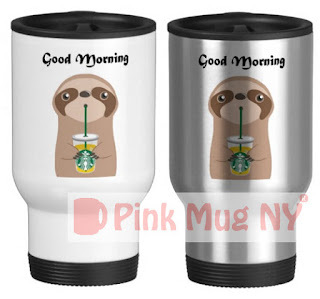 Cup features cute image of a sloth drinking from a Starbucks mug taking life easy. An absolute must for all sloth lovers who like to take life a little bit easier than most. The book contains a collection of charming illustrations and slothful sayings to slow down the seriousness of day to day life. Described by one customer as a ‘Funny and accurate procrastinator pearls of wisdom to share with those who just need a breather.’ Sounds perfect!! Drum roll please... Zoohood and its partner store Animal Costumes Shop which is the home of UK animal onesies is now part of the Tickled Pink Fancy Dress Group. 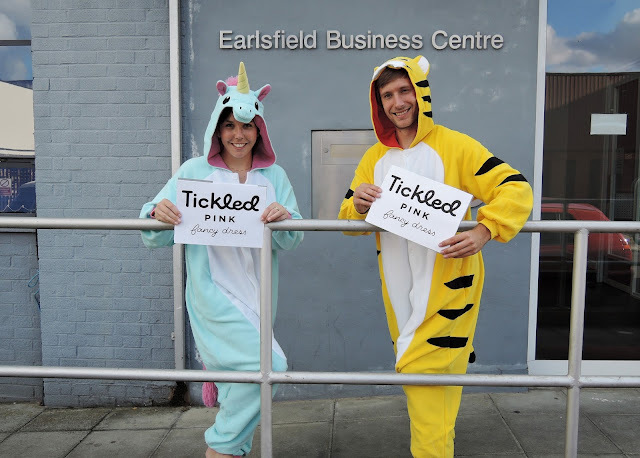 Tickled Pink are an online fancy dress retailer of fancy dress for events and festivals. Over the next few weeks there will be a few changes to the ZooHood website but please be patient and bear with us. We are working with a number of new and exciting distributors to bring you an updated range of animal onesies and animal related products for adults and kids from Sazac, BCozy, Sweet Hollic, ZooPack and Fuzzy Friends. Find out more about Tickled Pink over on the parent site by clicking here and if you have any questions please get in touch with the friendly Zoo Crew on 0203 643 2025. Woohoo! The team behind ZooHood are pleased to announce that we have launched our new project, 10 Stories. The idea is simple: Short stories written by kids, illustrated by artists. Back in April we worked with a class of 8-11 year old writers, and asked them to write us a set of very short stories, about 150 words long. The results were incredible. The stories included a farting unicorn, a terminally ill boy who develops wings, a wizard crocodile struggling to cope with bullying, and a toilet squid. Like we said, incredible. Next, we gathered a collective of 10 artists and asked them to choose their favourite stories to illustrate. They set about creating their artworks, either inspired by the story or illustrating its narrative. We weren't sure if the artwork would do justice to the fantastic stories, but by 'eck they sure did. Colourful, bold and beautiful, these pieces of art are something else! We've now combined the original handwritten stories with the corresponding illustration, and have made the combined piece available to buy as a poster or print, with 20% of our profits going to Rockinghourse, a children's charity which was voted for by our young writers. Here's a glimpse of some of the artwork, but check out the full range at www.10stories.co.uk. How Rainbows are Created is a story by 9 year old Rebecca about the origins of rainbows, featuring Gary the 21 year old farting Unicorn. Get the print here. Mr Magic is a story by 10 year old Lola about a wizard who can turn himself into a crocodile, and has an enemy who taunts him. Get the print here. The Non-Stop Talking Orange is a story by 9 year old Raneem about an orange who talks and talks and talks, and the tensions this causes in his relationship with other fruits. Get the print here. ...and don't forget to visit www.10stories.co.uk to view the rest. The ZooHood Summer Sale starts today. We've reduced our prices by up to 75% on 170 of our amazing animal onesies, T-shirts and animal-themed gift ideas. That's 75% off, on one of our most popular onesies! That's 61% off on this beautifully designed T-shirt. Buy it here, or get the women's version here. That's 75% off, on another great onesie. That's 30% off a great wolf tee on a lovely soft organic cotton. I have one of them myself! That's 66% off, for this beautifully made A4 notebook featuring a red panda illustration. That's 50% off, for an amazing green dinosaur onesie! And that's not all - there are over 170 products in our Summer Sale. Head on over to this page to check out the whole range.